Does electoral fraud stabilize authoritarian rule or undermine it? The answer to this question rests, in part, on how voters evaluate regime candidates who engage in fraud. Using a survey experiment carried out after the 2016 State Duma elections, we find that voters withdraw their support from United Russia candidates who are reputed to have used electoral fraud. This effect is especially large among strong supporters of the regime. Core regime supporters are more likely to have ex ante beliefs that elections are free and fair. Providing them information about fraud significantly reduces their propensity to support the ruling party. These findings illustrate that fraud is costly for autocrats not just because it may ignite protest—as several scholars have argued—but also because it can undermine the regime’s core base of electoral support. Because many of its strongest supporters expect elections to be free and fair, the regime has strong incentives to conceal or otherwise limit its use of electoral fraud. 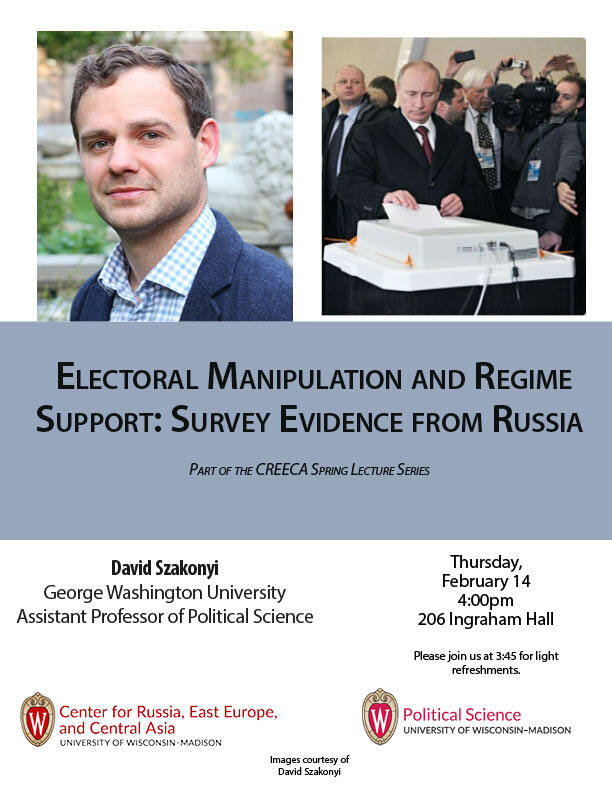 David Szakonyi is Assistant Professor of Political Science at the George Washington University, an Academy Scholar at Harvard University, and a Research Fellow at the Higher School of Economics in Moscow, Russia. His research is devoted to understanding how elites translate economic power into political influence and how policies can best be designed to curb corruption. Projects underway look at business people who run for elected office; the value of nepotism in government hiring; the effectiveness of anti-corruption campaigns; and factors affecting the survival of autocratic regimes. His work has been published in the American Political Science Review, World Politics, and Journal of Politics, as well as popular publications such as Foreign Affairs, Washington Post, Newsweek, and the Moscow Times. He received his PhD in political science from Columbia University and his BA from the University of Virginia.